Please click on the link above for a free quote for the different dental plans available from Renaissance Life & Health Insurance Company of America. You can select an annual benefit up to $3,500 per year. 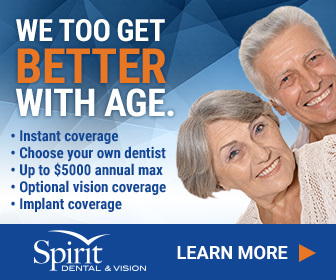 Implants are a covered major expense and up to three cleanings per calendar year. Please visit Dentalplans.com to view dental discount plans that give you the freedom to slect any dentist within their network without requiring care at the same location each time. National coverage is available with these plans with a large selection of carriers to select from.